Background: Rivaroxaban is the first oral, selective direct FXa inhibitor with rapid onset of action and its biological toxicity may be related to the enantiomer. Objective: The aim of the current study was to develop and validate a precise, accurate, and specific direct Chiral-RP-UPLC-MS/MS method for the enantiomeric separation and detection of rivaroxaban and its enantiomer. Methods: The present study screened various conditions of chromatographic and mass spectra, including chromatographic column model, flow velocity, phase ratio, column temperature, and collision energy, parent/daughter ion pairs, etc. Try to match the chromatographic and mass spectrometric conditions. Results: Good Rs (Rs>2.5) was achieved on a Chiralpak IC column (4.6 × 250 mm, 5µm) using H2O:acetonitrile (10:90) as mobile phase at 25 oC column temperature. The rate of flow was set at 0.4 ml/min and enantiomers were detected by triple-quadruple tandem mass spectrometry using positive electrospray ionization (ESI) with MRM transitions of m/z 436.07>144.95. The cone voltage and collision energy were kept at 48 V and 28 eV, respectively. The limit of detection and quantification of (S)- rivaroxaban were 0.39 and 1.30 ng/ml, respectively. This method was validated and found to be selective, precise, accurate, linear and robust for the quantitative determination of chiral impurities. It is also a good application for the blood samples analysis in vitro. 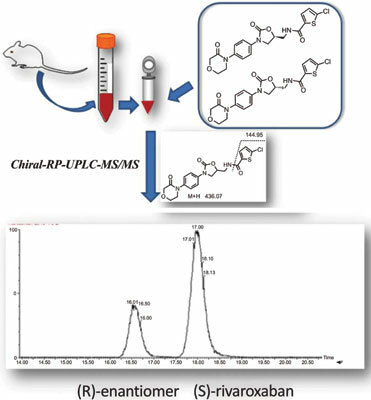 Conclusion: Chiral-RP-UPLC-MS/MS method has entirely detected (S)-rivaroxaban and its (R)- enantiomer in very low concentration and complex matrix directly, especially for blood samples. UPLC-MS/MS, enantiomers, rivaroxaban, chiral separation, in vitro, chiral inversion.